Some toys are I think unfairly ridiculed. I’ve always been a fan of the underdog and the misfit, and GI Joe has had its share of goofballs and weirdos. I dig them all. I really dig Crystal Ball. As a horror fan, how could I not? He looks straight out of Hollywood’s version of Transylvania. What’s so bad about Crystal Ball, really? He’s not ridiculously designed. Okay, okay maybe he is. Despite that fact, his look is quite appropriate if you can get yourself in a horror movie state of mind. It’s hard in the midst of a military-based toy line, but give it a try. There’s a way I think to make Crystal Ball more interesting in a more fantastical way than IDW’s recent take on the character. Bring out some of the Rasputin-like (or at least the pop culture version of the historic figure) quality of the character. Among other things, the legend is that he could (supposedly) control minds and such. If done the right way, CB could rise to the top echelon of Cobra as a real master of mind control. Check out Christopher Lee in Hammer’s film version if you can. Here’s the ridiculous US trailer. The film isn’t the kind of exploitation you’d expect from watching it, by the way. If Crystal Ball were presented in this way, I think he would make for a solid addition to the villainous ranks of Cobra, beyond the gimmick that he’s been. As a nice little bonus, the head sculpt bears a certain resemblance to horror icon Vincent Price. Haunting. I agree many intensely ridiculed figures don’t deserve the magnitude of ridicule they get usually though Crystal Ball is a bit on the weaker side of 1987. 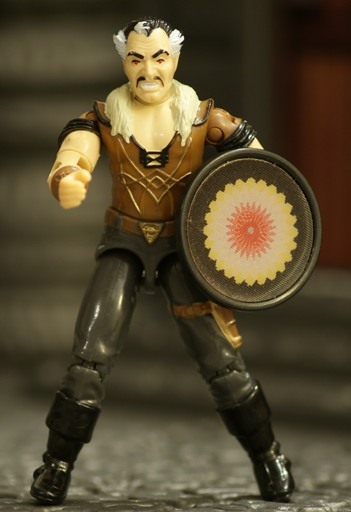 He only came with one accessory, the hypno-shield, in a year when accessories started to step up and in the other cases of figures with 1-2 accessories, often they were quite substantive (take Raptor. He has 2 but one is a pet, one is a large fabric, winged backpack). Among Cobra in 1987, he was the least interesting. Cobra Commander was a shiny, silver, armored Cobra Commander and the 1st CC on shelves in a while (the mail-order hooded CC was prominent in the 80s though), Techno-Viper came with an entire tool cabinet on his back and continued to cement ‘cool’ to the Viper name, Croc Master had a gigantic gator, whip, and crocskin vest, Raptor was Birdman meets Serpentor (I know he takes a lot of flak, but behind Cobra Commander, he was the 2nd Cobra I really wanted from 1987), Big Boa was a tough-looking boxer. These figures were all very eye-catching. 1987, 1989 & 1990 were strong years for Cobra. Crystal Ball does look like a character who could’ve walked out of a Wolf Man movie or a color 60s/early 70s Vincent Price movie. Of course, as much as people claim Crystal Ball is out of place, how about a crazed genetic frankenstein in snake armor and his me-too sidekick in animal outfitted motifs, Raptor? Or Lazer Tag Sci-Fi? Or biker gang punks being given prominent assignments? Or Sgt. Slaughter leading his Marauders into action behind enemy lines with nothing more than a baton, and with one of his men armed with nothing but a foam extingisher gun and an axe? Or crazy men bareshirted wearing metal suspenders, capes & monocles? In light of that, Crystal Ball isn’t much of a stretch. Also note a sort of opposition being set up between Crystal Ball & Psyche-Out for the minds of the opposing side, a real psychological war. I actually enjoy 1987’s outlandishness or willingness to experiment. It complemented 1986 being more conventional (figures like Leatherneck, Hawk, Wet-Suit, Mainframe, etc), although with a growing sci-fi element (Serpentor, BAT, Sci-Fi) quite well. We have to remember, 1987 had 1987 & 1986 figures on shelves. According to Yo Joe stats, Crystal Ball ranks 3rd to last in 1987 in how many have him and also how sought after he is (have + want). In the former, Sneak Peek & Gung-Ho are lower, in the latter, Sneak Peek & Psyche-Out are lower. Sneak Peek is sadly the most shunned figure from 1987, being a full magnitude below the others (I blame the lousy card art combined with a very plain, vanilla figure). Of course, even Sneak Peek has higher numbers than the special figures (e.g. Renegades, Cobra-La, Battle Force 2000). That’s usually the way it is. Oh, and Go Royals! Hope they make Game 7 a great one! Wow, you’re right about Jack Elam! I’d never seen the unmasked ’92 CC up close before. 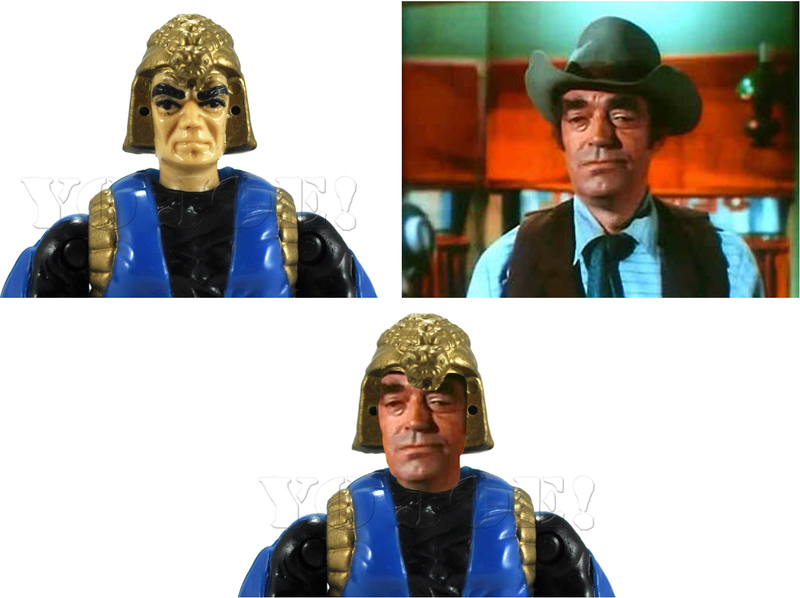 Someone at Hasbro must have been a fan and somehow got a Jack Elam action figure out there. I hope Jack got to see it before he left us because the likeness is remarkable. CB is getting a lot of love lately from customizers. Most of 1987’s output seems to have started the line’s decline. It was the first year where figures from the time are still actively shunned today. Were it not for the fact that it was a vanity project involving Stephen and Owen King, I might have cut Crystal Ball some slack, but Larry Hama never even used him during the comic’s classic run. It was Dave Cockrum, of all people, who gave CB his only shot at fame in a fill-in issue of Special Missions. I would rate Sneak Peek and Psyche-Out much lower in the desirability level. They’re interesting characters who received lousy figures. Still, Crystal Ball was warming the pegs in my area as late as the early 90’s, which earns him the award for Dud of the Year at a time where he had a lot of competition. I’m a big supporter of underdog characters. But Crystal ball isn’t exactly my favourite. In the mighty metropolis of Cootamundra [where I grew up] A Crystal ball sat on the shelf until 1998. I don’t know if someone bought him or if he was sent to another shop. I was never interested in Crystal Ball…largely due to the “pathetic” single accessory. I never had exposure to the comic as a kid, so I always attributed the waning interest of 1987 Joes to no longer having a cartoon … along with it seemed like it was the time for my friends to grow out of toys. I had to think for a minute, but as a kid, he was pretty useful to Cobra with the whole mind control angle. A one-man brainwave scanner, if you will. Silly, but it worked. Now, I’m not much into him, but I can appreciate his design for what he was. For me as a kid, I always avoided Crystal Ball chiefly for the relative lack of accessories, as others have said. In my eyes, a figure with several accessories simply held more value for my hard earned three bucks than a figure with just one (and one that is principally, defensive, at that). I had no aversion to the whackier, more outlandish elements of the Joe line (I loved both Serpentor and Raptor as a kid BECAUSE of how out there they were), so I probably would have picked up CB eventually, but there were simply too many figures (with more accessories) I wanted more perpetually on the shelves ahead of him. I think anything is good and fair in Cobra’s attempt to rule the world. The physical DNA manipulation of people (super soldiers, monsters, etc.) as well as other surgical enhancements (Strato Vipers, Hydro Vipers, etc. ), all seek to make Cobra’s might mightier. Not to mention making the ordinary Viper a virtual walking weapon with almost any weapons from rifles, to catapulted fireballs, to lasers, to fully body-armored/ helmet integrated/ weapon targeting systems. Crystal Ball only makes sense. And like a lot of things, he was ahead of this time. Take the concept of Octogenetics. That was part of the movie plot of Skyline, and without knowledge of what that light is doing, the movie makes a lot LESS sense. Look at that shield, Crystal Ball knows what he is doing with light manipulation, and if he has some sort of evil psychic ability power on top of that, a very potentially deadly character in the GIJoe universe. Now, we all know, “knowing is half the battle….,” and anything that gives Cobra Commander the power to get more power is just another day in the life of trying to rule the world. And not to mention, I always gave Crystal Ball a little “Yuri” flavor (from EA C&C Red Alert 2, Yuri’s revenge). Broadcasting brain controlling waves and taking control of the attackers army to use against them is quite a weapon. Of course, we know Cobra was already playing with low frequency waves in Greenland, which almost led to all out anarchy among the population, as well as a the GIJOE team destroying themselves…., if not for BF2K saving the day. His figure was a lousy seller. But it seemed like the Action Packs sat around forever, too, but they do not get as much hate. Yes, 1987 is a divisive year, in part due to Hasbro’s direction with the line and a generation of kids growing out of toys around that time. That said, i disliked Crystal Ball at the time, probably because I didn’t like Vincent Price back then. And as others have said, the lack of accessories didn’t help him. He was also redundant to Mindbender, who had the master of mind control angle first, even if he was more often just used as a mad scientist. Compared to later 90’s figures with only 2 or 3 colors in their whole look (Heat Viper V2, Eel V2), Crystal Ball is a quality work of art.